This workshop space is unique in that it stretches out onto the rocks in Muizenberg. It is a heritage site and soon to be renovated into an upmarket venue. The sea will surround us, and the mountains will stand behind. The weekend will be full of ocean and water, representative of the journey that we will all be on. Just as those explorers set out to find the new lands and opened up new spaces to all of us, bringing us into contact with a far vaster range of culture than we were aware of, so these journeys open up inner spaces that we will have to cross vast waters to appreciate. In the evenings we will gather over supper to share and using the group energy to deepen the experience. As one wise man said, “Each one of us is a spark of Divine energy. But when we gather in Sacred space, we become a flame.” We will encounter the shape of our cloaks, and discover wonderful new spaces for reparation. We gather for supper on Friday night the 4th of Feb and through the honoring of the Sabbath day, we facilitate the transition from mundane to sacred space. For the work to be most effective, we need the space of honoring, of unconditional love. We will discuss and describe some of the processes, the purpose and goals of the processes we will be exploring during the weekend. Essentially we will be leading you on journeys into the inner realm, the place of our avatars, where our non-material bodies, our souls, exist. There we will seek out and encounter the veils that our souls are clothed in that are essential for our incarnation on our 3D Mother Earth. We use the Kabbalah and the Sefirot of Compassion, Passion, Creativity, Majesty, Mercy, Severity and Foundation to explore the shape of these veils. Each time, upon our return, we will ground these experiences in this world by some expression of what we have discovered, either through drawing (no art experience necessary) and/or writing and/or various interactions with the ocean and its natural gifts that we will be ensconced in. In the evenings, we will gather together to share bread and our stories. Only when we interact as compassionate witnesses from our higher hearts do we truly understand. And the images and energies that we will discover will speak to us of these things. Bring something to lay down on while journeying and to sleep on if you want to stay over (please let us know if you would like to do this). WE WILL HAVE SOME GREAT MOVEMENT ON SAT EVE !! Bless you all. May we all learn the ways and deepen our understandings of that infinity we are custodians of. 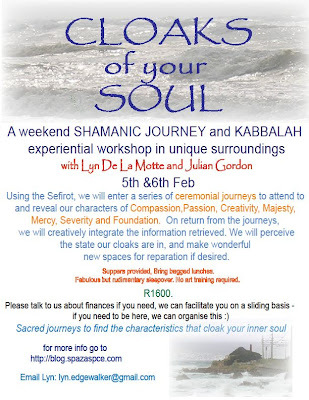 The content of the workshop is based on the Kabbalistic Tzimtzum ( http://en.wikipedia.org/wiki/Tzimtzum ) and the Sephirot ( http://en.wikipedia.org/wiki/Sephirot#Listings ). In short, when God created the world he (and I use the masculine specifically here) created spaces for existences. That is the Tzimtzum part. It is in these spaces that we find our cloaks. The Sephirot are the spheres that make up the Kabbalistic Tree of Knowledge. You have probably seen it. Each sphere emanates a specific quality or characteristic. We will be journeying for 7 of these emanations for the workshop (there are 10 Sephirot) These emanations are: Chesed = Mercy, Gevurah = Severity, Tiphareth = Compassion, Netzach = Passion, Hod =Majesty, Yesod=Foundation and Malchut= in this instance for Malchut, we will journey for our cloak of Creativity. Kabbalistically, each of these emanations are like Cloaks for the Soul to exist here on earth, we wear them as characteristics of that expression of ourselves. So, we will do a series of journeys to find our character of these emanations and when we return from the journey, we will draw or write a rendition of that characteristic of our soul (so we can see it), see what state our cloaks are in, explore what we can do if repairs are needed, open wonderful new spaces. For example what does the state of your cloak of Mercy look like, what does your cloak of Passion look like, what does your cloak of Majesty look like? It may sound complicated because of the Kabbalah but one doesnt need to know all that as these journeys can be used on many levels (psychoanalytically, poetically, artistically, or shamanistically to heal and understand those parts of ourselves). The journeys are sacred and personal so whatever way it speaks to a person is correct. 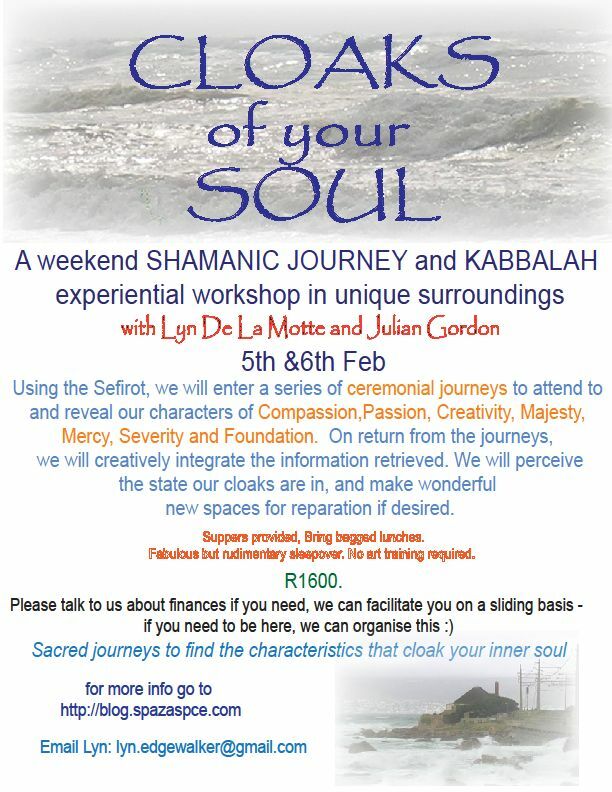 All you really need to know is that you will journey to find out about 7 characteristics that cloak your inner souls!